This guest post is from Krista Wright, the executive director of Polar Bears International. We’ve partnered with PBI to share a fascinating look at polar bears in the wild using Google Maps. -Ed. In Inuit poetry, the polar bear is known as Pihoqahiak, the ever-wandering one. Some of the most majestic and elusive creatures in the world, polar bears travel hundreds of miles every year, wandering the tundra and Arctic sea ice in search of food and mates. Today, with the help of Street View, we’re celebrating International Polar Bear Day by sharing an intimate look at polar bears in their natural habitat. We’ve joined forces with Google Maps to collect Street View imagery from a remote corner of Canada’s tundra:Churchill, Manitoba, home to one of the largest polar bear populations on the planet. 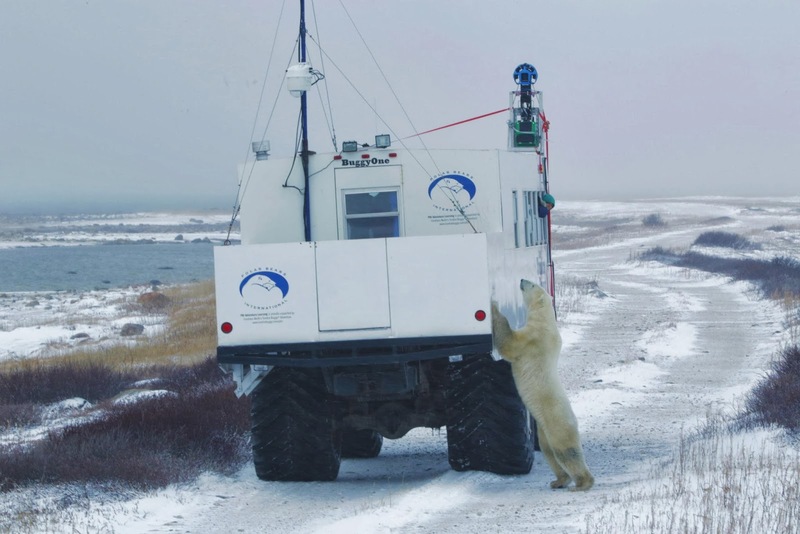 With the help of outfittersFrontiers North, the Google Maps team mounted the Street View Trekker onto a specially designed “Tundra Buggy,” allowing us to travel across this fragile landscape without interfering with the polar bears or other native species. Through October and November we collected Street View imagery from the shores of Hudson’s Bay as the polar bears waited for the sea ice to freeze over. There’s more to this effort than images of cuddly bears, though. PBI has been working in this region for more than 20 years, and we’ve witnessed firsthand the profound impact of warmer temperatures and melting sea ice on the polar bear’s environment. Understanding global warming, and its impact on polar bear populations, requires both global and regional benchmarks. Bringing Street View to Canada's tundra establishes a baseline record of imagery associated with specific geospatial data—information that’s critical if we’re to understand and communicate the impact of climate change on their sensitive ecosystem. As we work to safeguard their habitat, PBI can add Street View imagery to the essential tools we use to assess and respond to the biggest threat facing polar bears today. We also use the Google Maps API to support our Bear Tracker, which illustrates the frozen odyssey these bears embark on every year. As winter approaches and the sea ice freezes over, polar bears head out onto Hudson Bay to hunt for seals. 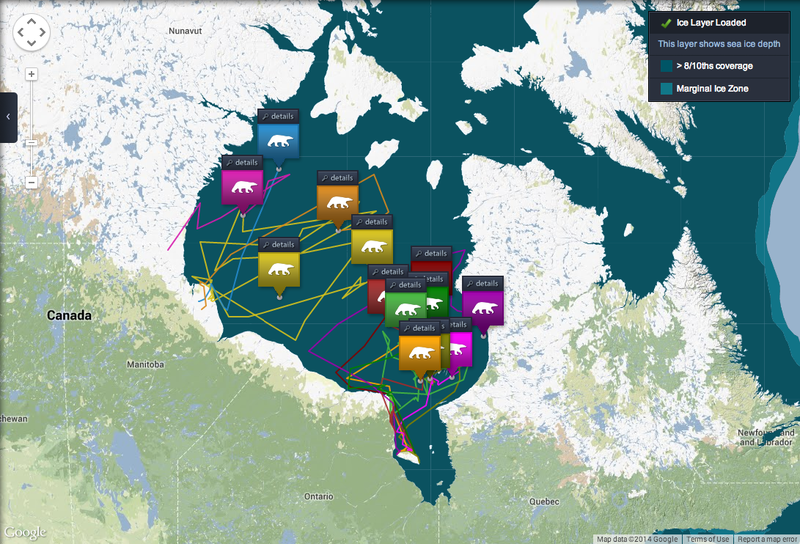 Bear Tracker uses of satellite monitors and an interactive Google Map to display their migration for a global audience. Google’s trip north builds on work they’ve done in the Arctic communities of Cambridge Bay and Iqaluit. In the town of Churchill, the Google Maps team conducted a community MapUp, which let participants use Map Maker to edit and add to the Google Map. From the Town Centre Complex, which includes the local school, rink and movie theatre, to the bear holding facility used to keep polar bears who have wandered into town until their release can be planned, the citizens of the Churchill made sure Google Maps reflects the community that they know. But building an accurate and comprehensive map of Canada’s north also means heading out of town to explore this country’s expansive tundra. And thanks to this collaboration with Google Maps, people around the world now have the opportunity to virtually experience Canada’s spectacular landscape—and maybe take a few moments to wander in the footsteps of the polar bear.